A large and airy new building that dwarfs the previous arrangement, which it replaced in 2011. First two hours free for all vehicles, after which cars must pay £15 and HGVs, caravans and motorhomes £29. HGVs can pay £30.50 to include a £10 food voucher. Prices are paid using PayByPhone - more details. The location code is 2432. 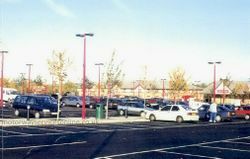 The car park, in 1996. A large dog walking area/riverside walk has always existed down the side of the services, but was only recently given prominent signage. In 2016, Moto refurbished the M&S Simply Food store and an M&S Coffee to Go machine was introduced. During 2017, the EDC restaurant and Moto Meetings meeting room closed to make way for a new Arlo's Pantry and Kitchen and Chow Asian Cuisine. Both of these opened in late June 2017. Moto's first recent KFC opened here in February 2018. 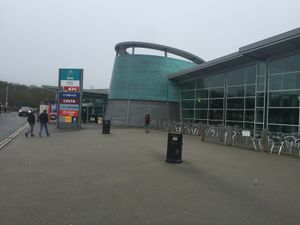 The filling station is operated by Euro Garages and was refurbished in summer 2016 to include a new Subway store. Euro Garages have installed signage around most of the services promoting their portion of the site. Cherwell Valley is one of very few services not be named after a precise settlement. At the time it opened, developers were paying a lot of attention to landscaping, and liked suffixes such as "Park", "Green" and "Valley" which helped create the image of a tranquil resting spot.